Miguel Díaz-Canel has been President of the Republic of Cuba since April 19, 2018. He was elected, through indirect suffrage, by the 605 deputies of the Cuban Parliament, the President of the Council of State and the President of the Council of Ministers for a five-year term of office. His position combines the functions of President of the Republic and Head of Government. 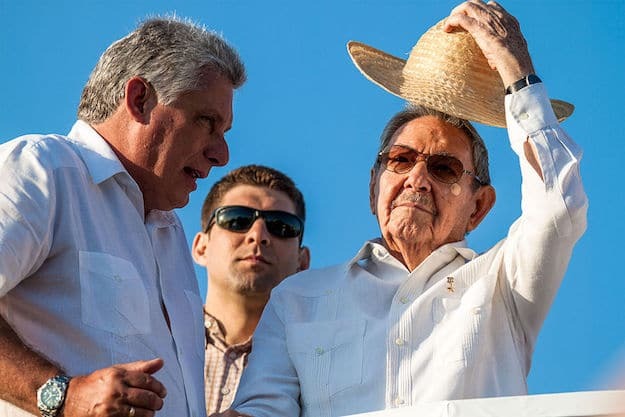 He succeeded Raul Castro, in power from 2006 to 2018, and thus became the first leader born after the triumph of the Revolution to occupy the highest office in the country. Translated from the French by Larry R. Oberg. Originally published by L’Humanité as “Cinq questions/réponses sur les élections présidentielles à Cuba,” April 23, 2018. A Doctor of Iberian and Latin American Studies at the University of Paris IV-Sorbonne, Salim Lamrani is a lecturer at the University of La Réunion, and a journalist specializing in relations between Cuba and the United States. His new book is titled Fidel Castro, héros des déshérités (Paris: Editions Estrella, 2016). Preface by Ignacio Ramonet. He can be contacted at lamranisalim [at] yahoo.fr, Salim.Lamrani [at] univ-reunion.fr or via facebook.